We keep an updated library of listings on where and how fans can watch Minnesota football online legally. No more wasted time searching the Internet in vain trying to find the Gophers football game live streams on sketchy websites. We find the official sites that broadcast Minnesota football games live and compile the links here on Big Ten Football Online as a free service for the fans. We do all the leg work before kickoff so you don’t have to worry about finding the game. We have never hosted an illegal Minnesota football live stream or posted links to games other than those that access the official digital media partners of the Minnesota Golden Gophers. Bookmark Big Ten Football Online for our collection of the legal, official live streams for every Big Ten Conference school in one convenient location. Big Ten Football Online is an independent fan site that helps the fans find out where they can watch Minnesota football online legally. Make sure that you only click on official Minnesota Gophers football live streams. Never click on Minnesota football live streaming links you don’t trust – you will get a virus! Gopher fans get VIP access to interviews of players and coaches, pregame and post game coverage, behind the scenes videos and more. Watch Minnesota Gophers sports online twenty four hours a day, seven days a week – football, basketball, hockey, baseball – if you want it, you can watch it live online, even classic games from many years ago on Gopher All Access. Watch Minnesota football games online – Find out where you can watch Minnesota Golden Gophers football on your PC, iPhone, iPad or tablet. The Golden Gopher Radio Network does the audio for every football and basketball game online. Every University of Minnesota conference game and non-conference game is broadcasted on TV through FOX Sports, Big Ten Network, ESPN and ABC and the games are streamed live online on BTN2Go, the official Big Ten Conference live streaming media provider. Our favorite site to watch Minnesota football online has got to be Gopher All Access. Get exclusive digital coverage of every Gopher sporting event streamed to any device anywhere in the world, and best of all, it’s the official live streaming digital media partner of the University of Minnesota. 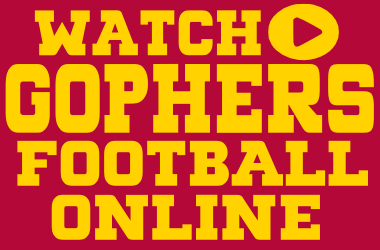 You’ll see quick that it’s the best way to watch the Gophers football game online! The University of Minnesota was established in 1851 and the campus is located in Minneapolis and St. Paul, Minnesota. The twenty-three varsity athletic teams at the University of Minnesota are known collectively as the Golden Gophers. The Minnesota Golden Gophers began competing in varsity football in 1882 and are one of the oldest and most storied football programs in the US. The Golden Gophers football team has won seven national championships and eighteen Big Ten Championships. The Minnesota Golden Gophers – Wisconsin Badgers football game has been played nearly every year since 1890 and is the longest running Division I FBS rivalry. The two programs compete every year for the Paul Bunyan Axe, a traveling trophy tradition that began in 1948. Visit Big Ten Football Online to find out where to watch the Minnesota Gophers football games online this season. Get the schedule, date, time and channel for all Golden Gophers football and basketball games.